What if it were your kids' School the Israelis were demolishing? What if it were your kids’ School the Israelis were demolishing? On July 12, 2015, Israel announced that it would seek to carry out demolition orders of structures in the Palestinian village of Susiya in what is known as Area C, an area that covers 60 percent of the West Bank, under Israeli control, including the tiny school that consists of four classrooms, three toilets and a kitchen. Before the school was built in 2010, the original classrooms were made of tents that were destroyed by a heavy storm. The school and kindergarten are among the 170 structures in Susiya that face demolition orders. Other structures include 32 residential tents, 26 animal shelters, 20 water cisterns, 20 latrines and two health clinics. The demolition orders can be implemented at any time. Israel says the structures can be demolished because they were built without permits and are illegal. According to the UN Office for the Coordination of Humanitarian Affairs (OCHA) Israel has rejected more than 90 percent of building permit applications. That means most Palestinians must choose between building without a permit or not building at all. Seventy-year-old Sara Nawaja’a has witnessed three waves of displacement in her lifetime. “In 1986, the Israeli authorities declared the area of my original house in Susiya an archaeological site and evicted all of the residents in Susiya to a new site”, she said. “But after that in 2001 they declared the area as military zone, and demolished all our tents. We had to move to this site half a kilometer away. Demolitions also happened in 2011, and we have received the latest demolition order last month”. Residents continue to fight the orders through the courts. Close to the village is an Israeli settlement that shares the same name. “Israeli citizens living in Susiya settlement have a swimming pool and playground, but we are not even allowed to build a cistern!” said Mohammad Nawaja’a, a 12 year-old. “I love playing football, but I want to be a journalist and write all the stories of injustice in Palestine”. In addition to the demolition threat, the village suffers from a lack of basic infrastructures and is not connected to the main electricity or public water supplies. According to various humanitarian organisations, in 2014 alone, 800 olive trees and saplings owned by Palestinian residents of Susiya were vandalized and damaged by Israeli settlers. Susiya residents spend up to a third of their income to pay for drinking water brought in via tanks, costing them around €5 per cubic meters ($5.5 per 35 cubic feet) – five times higher than the water costs paid by nearby Israeli settlers, who are served by the Israeli water network. Demolitions in Area C are also on the rise. OCHA reported that on average 64 structures were demolished each month in the first three months of 2015 in Area C – compared to 51 demolitions over the same period in 2014 and 53 in 2013. 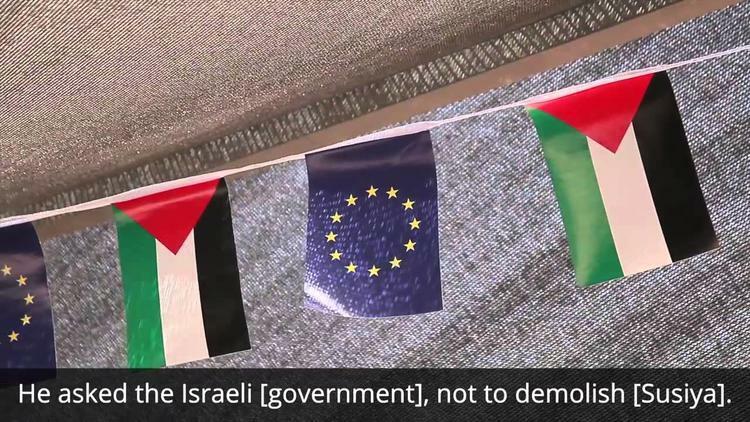 The European Union has repeatedly called upon the Government of Israel to put an end to demolitions in Area C and has highlighted the worsening living conditions for Palestinians living there. Humanitarian assistance is provided to communities in need in Area C through the European Commission’s Humanitarian Aid and Civil Protection department (ECHO). In Susiya, ECHO has supported humanitarian partners to provide water and sanitation services to the children, as well as rehabilitate some classrooms. But in the meantime, while the school has opened for the new term, children and their parents are still uncertain about the future. The question that remains for Mohammad and other children in Susiya: what if we wake up next day, and we find that our school has been demolished? The views expressed in this article are the authors and do not necessarily reflect Ma’an News Agency’s editorial policy.